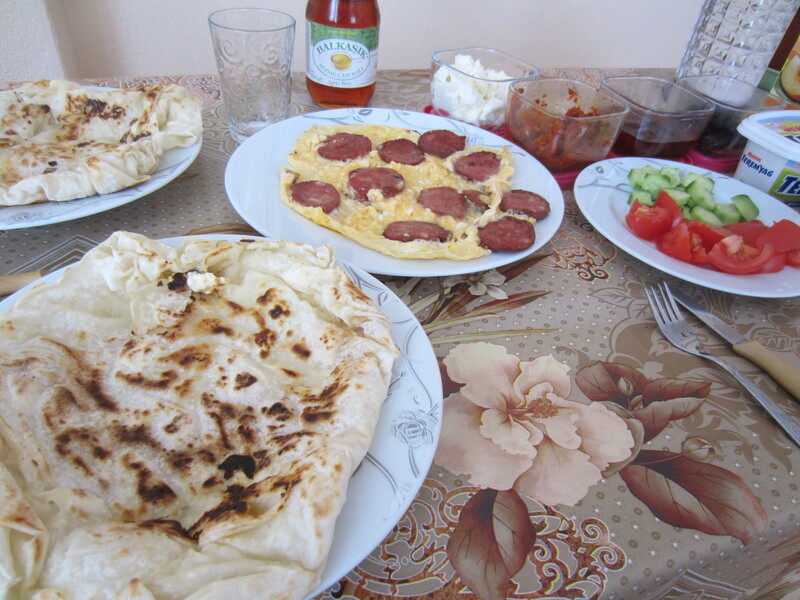 Kahvalti means breakfast in Turkish. 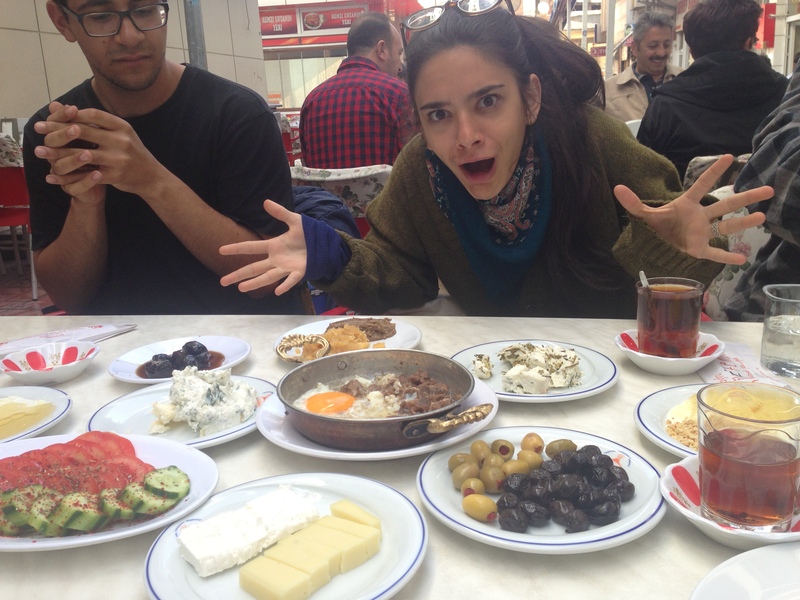 What a ‘typical’ Turkish breakfast consists of could be debated (endlessly?) but some of the basic staples are bread, tomatoes, cucumbers, and cheese. Let’s follow that basic list with runners-ups: olives, eggs, and sweet spreads (jams, ‘bal-kaymak,’ which is honey and clotted cream, pekmez (often with tahini, the much improved Turkish equivalent of PB and J)). We’ll add to the list some other commonly found additions, like borek, sucuk or other sausages, cold vegetable dishes and, increasingly, french fries. This pictures below will evince this, but it should be noted that Turkish cay (chai… tea) is the necessary complement to the breakfast meal, despite the fact that the name for breakfast, kahvalti, literally translates to ‘a base on which you can drink coffee.’ Traditionally tea is drunk during the meal, and Turkish coffee follows the meal. Whoa now, you say. That sounds like a lot of food. Oh yeah, it is. 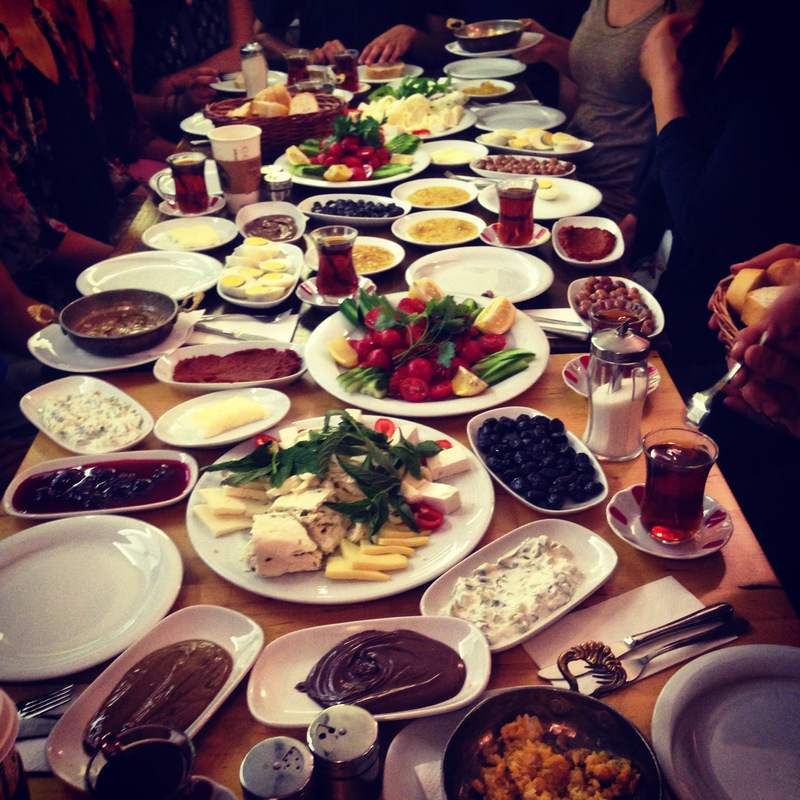 This image is of a fabulous breakfast place in Cihangir, Beyoglu in Istanbul, called Van Kahvalti Evi. 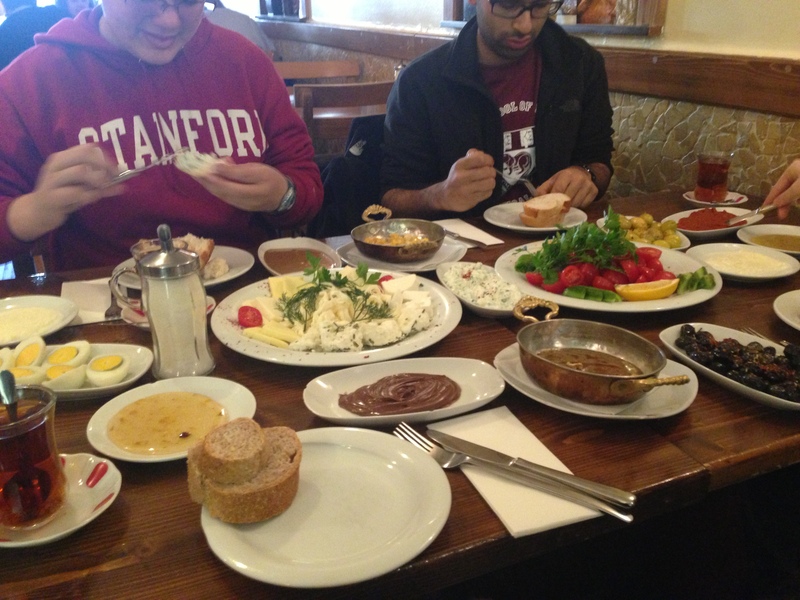 I absolutely recommend it to anyone traveling to Istanbul who wants to experience an authentic breakfast. 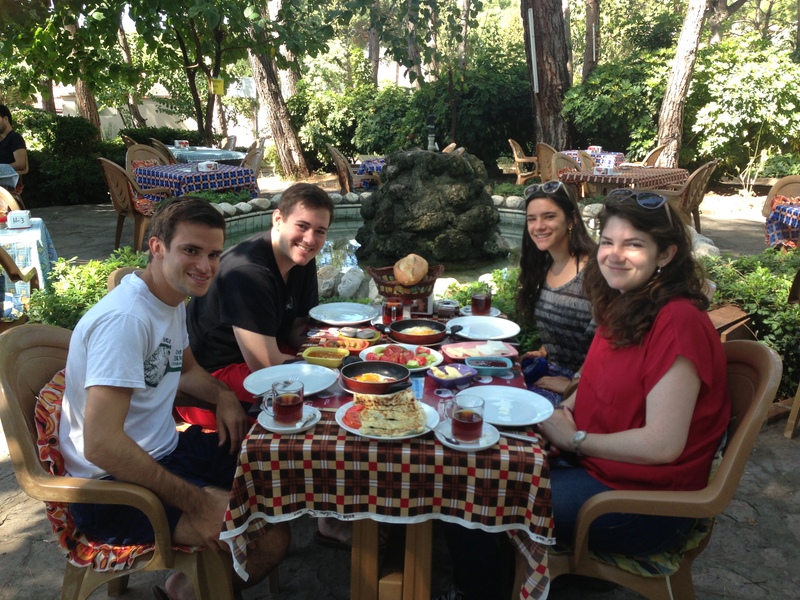 The city of Van, located in the far east of Turkey, is famous for their breakfasts. In the next few days, in fact, Van residents are attempting to break the world record for the most crowded breakfast table! Two food items are particular to Van Kahvalti specifically are visible above. The most famous is Van otlu peyniri, or ‘van herb cheese.’ It’s very salty, but delicious. The other is called kavut, made of ground wheat… my friends and I have a difficult time appreciating this one due to the texture, which is very gritty. My friends and I traveled to Van to experience their authentic Kahvalti, and we were not disappointed. Above is a picture of me in Van, not disappointed. The plate closest to me 2 images above, and the plate closest to the bottom hold two ‘local-to-van’ breakfast foods. The darker of the two is kavut, mentioned above…. you can see how gritty it is, even from the picture. Kavut also goes by the name “devseyiti.” The chunky-looking, caramel-colored food next to the kavut is alternatively called ‘jejerun’ or ‘murtuga,’ and it consists of bread that is coated in flour and egg and fried. This Van ‘kahvalti salonu’ (breakfast joint) is the only place I’ve ever seen this food. Another shot from Van Kahvalti Evi in Istanbul, on a different occasion. The plate just up from mine (with the two pieces of bread) is honey, which is often locally sourced and has bits of the comb still (as you can see above)…. sometimes more than bits…. so yum. As described above, honey is often served along with clotted cream (bal=honey, kaymak=clotted cream), especially in the eastern part of the country. A decadent but delightful way to start a morning. Above are some of the more elaborate kahvalti spreads I’ve experienced, and they focus on the specific culture of Van (which has Kurdish influence,among other things). 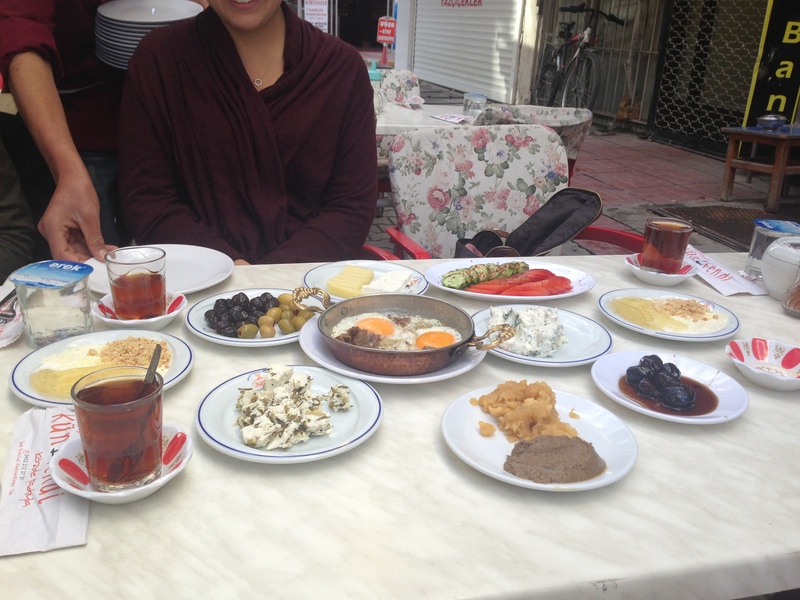 However, the INSTITUTION of breakfast in Turkey isn’t limited to a region. This one is at a cafe in Eskisehir. 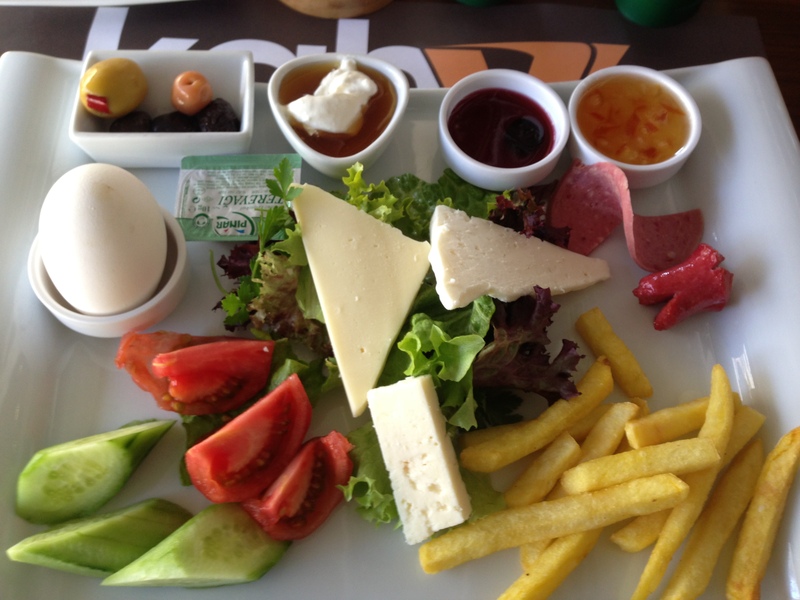 Note the bal-kaymak (next to the olives), the boiled egg, the french fries, and the little fried sausage, which are also common. This is a fairly typical offering when ordering a “breakfast plate” from a cafe. 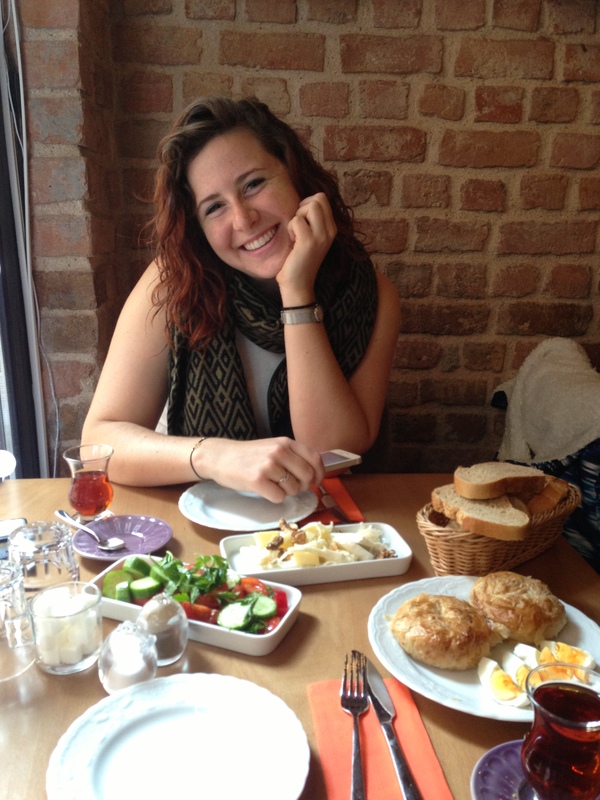 My beautiful friend at a different lovely cafe in the Cihangir district in Istanbul. The two bread-looking objects next to the boiled eggs are gul boregi “rose borek,” a flaky pastry filled with cheese. 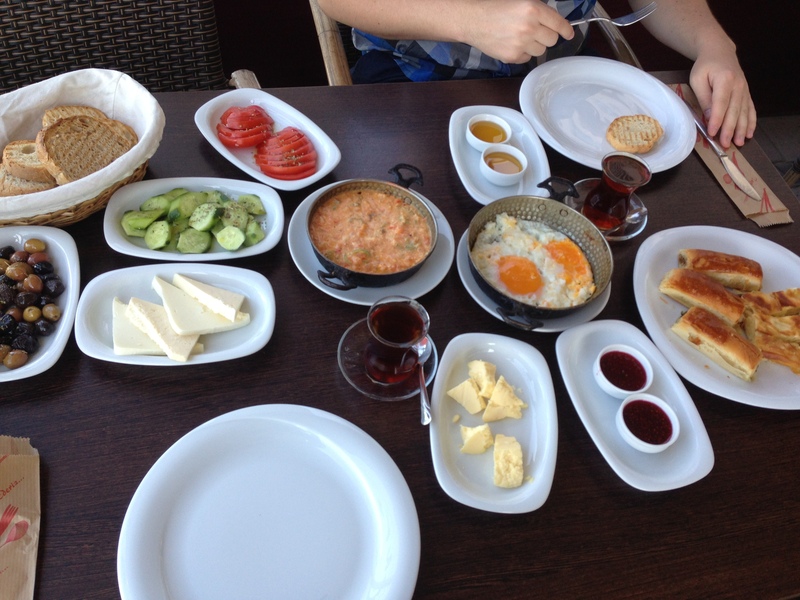 This spread is from a sea-side cafe along the Kordon in Izmir. On the far right you can see a different variety of borek. In the middle, to the left of the sunny-side up eggs is one of the key standards of Turkish breakfast: menemen. It’s very similar to a Lebanese or Tunisian shakshouka– a mixture of tomatoes and peppers cooked with eggs. 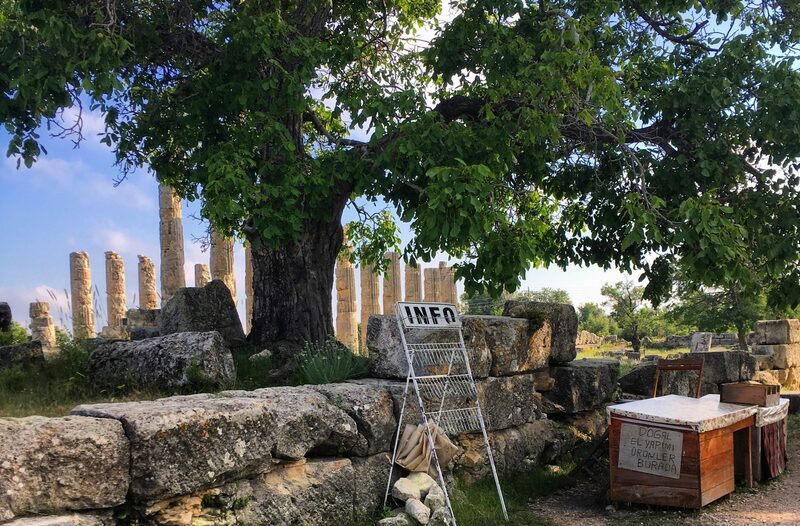 The spice level of menenmen can vary wildly– a group of us tried some at a roadside tea garden in Adiyaman province in the southeast, and many wept, sweated, and wailed from the spice (me). College kids often joke that it’s the one dish they can prepare besides pasta. Variations on menemen are popular, including with sucuk (spicy garlicky sausage), cheese, etc. Here’s a breakfast morning at my home in Kirikkale. Our friend sucuk makes a re-appearance, this time in omelette form. In the foreground of the image is gozleme. Gozleme is a distinctly Turkish and notoriously poorly translated food. Most often tourists are told it is a pancake, or ‘savory pancake;’ neither of those do gozleme justice. It is a very fine crepe-like dough (not sweet) filled with variable items like cheese, mice meat, spinach, eggplant, etc.) and cooked on a ‘sac,’ a rounded griddle (the same stove-thing used to make manouche). It’s just awesome. There’s a lot that can be said about Turkish breakfast, but beyond all the food, perhaps the most important thing about kahvalti is the way it is eaten: slowly, in a relaxed atmosphere, preferably with great people. An important aspect of Turkish culture is that of ‘keyif,’ which someone once described as “a pleasurable state of idle relaxation.’ As well as being delicious, kahvalti should be keyifli.